Do you believe that many financial rules are only there as a guideline? Most of the rules that govern your finances are meant to help you manage it better. There are various rules from how you need to save money to set aside some funds for future needs. These rules are what people aspire to follow with the firm belief that if they are able to walk in step with them, it will give them positive results. These rules are set out to help you manage your money more effectively. However, you need to keep in mind that when it comes to your finances, there is usually no one size fits all types of financial rules. The decisions you make should come from where you stand in terms of your finances and how you want to get to your goals in life. Think of these rules as part of the bridge that is supposed to bring you from one end to the other. Coming from that analogy, you need to know that not everyone can use the same bridge. Some might be able to make do with a small one but other people would need a sturdier one. You might fit in a narrow bridge but there are some who would need a wider one. This simply means that there are financial rules that would work for you and some where you need to bend the rules a little. It is a lot different from the law where you need to follow it to the letter. Rules about your finances are something you learn through a series of trial and errors and which one works best given your current situation in life. 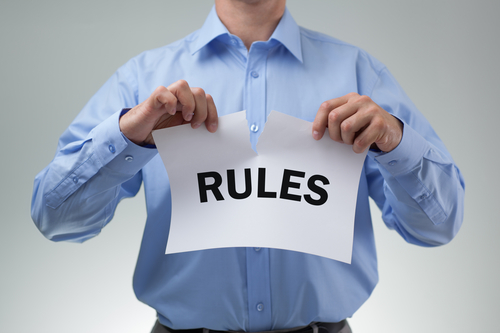 With that, here are some of the rules you can break in order get ahead with your finances. One of the most important accounts you need to have is your emergency fund. Not only will it support you through difficult times but it can also prevent you from sliding further in debt. This is because when you are caught off-guard with unexpected emergencies and you have no savings at all, your first instinct is to borrow, take out a loan, or use any line of credit you have. With an emergency fund, you are not left to borrow money and use whatever savings you have. That is if you have any savings at all. CNN shares that at least 25% of Americans have no reserve funds to speak of. Part of the reason could be that financial rules dictate that consumers need to have at least six month’s worth of expenses in reserves. First off, you have to start somewhere so it would be challenging to have that much at the beginning. You should also not limit your emergency fund at just six month’s worth of expenses. If you can and if you need to, you can save more than that. You can also save less than that target as long as you have other sources of resources in case an emergency strikes. One of the financial rules you need to break as soon as you can talk about how much you can set aside for savings. If you can, you are allowed to save more than just 10% of your income. Doing so can even help you achieve your financial goals faster. You might be able to retire earlier, put in more of your money into investments, or even start that business you have been dreaming about. In the same concept, you should not stretch your finances if 10% is not doable. Start with an amount that you can set aside and work from there. What this does is it teaches you the habit of saving money. You could have a tough time-saving money when you are already making millions when you did not get develop the habit early on in your life. One of the financial rules that you could have misunderstood pertains to credit card use. This stems from the fact that a lot of people are in financial debt because of their credit cards. Magnify money even shares that a whopping $104 billion were paid by Americans in 2018 just for credit card interest and fees alone. What you need to know is that a credit card is simply a financial tool you can use as you manage your finances. In fact, it can even help you increase your credit score and take advantage of merchant discounts. However, this does not mean you should swipe with abandon. Use your credit card but make sure that you pay for your charges in full when the statement comes in. There is nothing wrong with trying your best to stick to a job to help you support your way of life. In fact, this is one sign of financial independence after college. However, there are a number of reasons why you might feel that you have to start looking for a new job. One could be trying to trade up to a higher salary, better working conditions, opportunities, or even for a better boss. These are just some of the reasons why you might want to break one of the long-standing financial rules of sticking to a job for a long time. They even say that a rolling stone gathers no moss. You need to understand that times have changed and that advances in several industries have also opened up a myriad of career opportunities for you. This is the prevailing rule when it comes to mortgage loans because people are trying to do away with private mortgage insurance or PMI. It is where homeowners are made to pay a premium for an insurance meant to cover the loan in case they default. This is undertaken when the down payment on the loan is less than 20%. If you can save up for it, by all means, put down 20% or more into your mortgage loan. This will help you lower down monthly payments. However, you can put down smaller amounts than that because as you try to save up for a bigger downpayment, house prices can be going up. You are left chasing a moving amount that would take you time to reach. In fact, the National Association of Realtors shared that the median down payment for first-time home purchasers is only at 6%. This is one of the financial rules that you need to closely look into after you have started making payments on your mortgage loan. On one side, it makes a lot of sense because there is a good chance your mortgage loan is your biggest debt payment for years to come. You also get to quickly increase your equity on the house. However, there might be instances when that extra payment you are putting down on the house can be best used elsewhere. For instance, if you can find an investment opportunity that can yield higher returns compared to the interest you are paying on your house, that can be a better use of your money. Remember that your mortgage can be your biggest loan amount but it can also be your lowest interest rate. You could be looking for ways to budget better as a couple and one of the things you look into is saving on your food expenses. Apart from cooking your own food at home, this also meant that you have to buy your own ingredients and buying in bulk can help you save money at the counter. This is true but you need to make sure that you are buying the things you need. The last thing you need is buying in bulk but end up wasting away some of the items you bought. There are a lot of financial rules that can help you with your finances but you always need to consider your financial situation. There are times that the best thing to do is break these rules and forge your own financial path.